Henry Holt and Co. (BYR), 9780805097573, 208pp. Here is a compelling middle grade nonfiction tale of how one classic writer drew upon a rugged life of adventure to create works of literature, punctuated by stunning black-and-white art by Wendell Minor and illustrative photographic material. 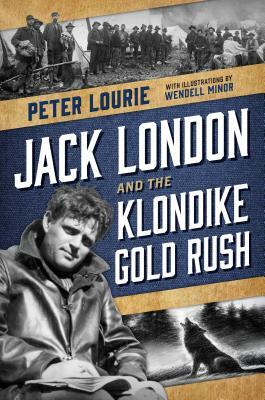 Swept up in the Gold Rush of 1897, young Jack London headed north to strike it rich in the Klondike and discovered something more precious than gold—the seeds of the stories that would flower into his classic novels The Call of the Wild and White Fang, and timeless short stories such as "To Build A Fire." This gripping tale follows London as he treks up the ruthless Chilkoot Trail, braves the lethal Whitehorse Rapids, survives a bad case of scurvy, and conquers many more dangers of the Yukon during his quest for gold. Peter Lourie has written many award-winning nonfiction books for young readers. A true adventurer, he has traveled all over the world to research his subjects—from the cloud forest of Ecuador in search of Inca treasure, to Lake Turkana in northwestern Kenya on the Ethiopian border, to Tierra del Fuego, and the jungles of Rondonia, Brazil. He is the author of several books about the Arctic: The Polar Bear Scientists, Whaling Season, and Arctic Thaw. He lives in Vermont with his family. Wendell Minor is the award-winning and bestselling illustrator of numerous books, including Ghost Ship, by Mary Higgins Clark. He lives in Washington, Connecticut.